Liedekijn, the group exhibition, opened on Thursday with great fanfare and corsetry. Gavin the Thomson has taken some great photos and written a lively summary of the night on his Sketchbook Scribbles art blog. You have till 8 April to see the exhibition at The Front Gallery, and the art-books are available from Impact Comics Canberra and All Star Comics Melbourne until sold out. In the photo below you can see an installation shot, with Katie Winchester’s work on the left (with part of the liedekijn tale above) and my collaborative work (made with Wes Hobday) on the right. In addition to the exhibition opening, there was a follow-on liedekijnish “comicky ziney dinner night” which featured wonderful talks by Katie Winchester, Tim McEwen and Bruce Mutard, and the industrious Gavin has also written a summary of the talks and the reluctant star of the night, dramatic exploding beer. What I really took away from the talks was the link between commercial work or jobs for the cash dollars and personal projects. Katie spoke about the importance of having a passion or interest in client-directed work to make the process more enjoyable and productive, and it was interesting to see Tim’s searchlight intelligence approach in linking concepts (everything’s connected, like the commercial-personal dialogue), and Bruce’s painstaking approach to research really showed his passion for war narratives in comic format. This connection between commercial and personal work conjures a vague memory of reading (a long time ago!) that artist René Magritte had a job creating rose designs for wallpaper, and how this bled into his own work. I need to verify this in his catalogue raisonné as I am unsure if I have somehow created this fact by melding fact and fiction in my brain (so this paragraph might change!). Katie talked about having your heart in a work, and look, I have found an apt reflection on Magritte’s work and hopefulness of the soul – “My heart fills the world like Magritte’s rose.” (Maso, 2000, p. 109). Maybe it’s appropriate that Magritte’s rose in works such as The Tomb of the Wrestlers (Le Tombeau des lutteurs) (1960) apparently responds to (but does not illustrate) Leon Cladel’s themes of unrequited love and stabbing one’s own heart with a dagger (Stotzfus, 2011, p. 174). Perhaps the stabbing occurs not only in instances of broken-hearted wrestlers (as in Cladel’s book), but when commercial artistic works don’t make the heart sing (or stabbing in the liedekijn tale, but this is less self-inflicted). Oh well. As Maso says, “Every rose pulses.” (Maso, 1995, p. 26). Remember to visit the liedekijn exhibition and make your pulsing heart sing. Maso, Carole. “An excerpt from “The Room lit by Roses””. Bomb, No. 73 (Fall, 2000), 108-111. Accessed via JSTOR, 30 Mar. 2013. Maso, Carole. “Carole Maso: An Essay”. The American Poetry Review 24.2 (Mar/Apr 1995), 26. Accessed via JSTOR, 30 Mar. 2013. Stoltzfus, Ben. “Magritte, Cladel, and the tomb of the wrestlers: roses, daggers, and love in interarts discourse.” symploke 19.1-2 (2011): 173-190. Accessed via Literature Resource Center, 30 Mar. 2013. Thomson, Gavin. “Liedekijn – Exhibition opening night!”. (29 Mar. 2013). Retrieved from http://sketchbookscribbles.com/liedekijn-exhibition-opening-night/ on 30 Mar. 2013. Thomson, Gavin. “Recap of the comicky ziney dinner night”. (30 Mar. 2013). Retrieved from http://sketchbookscribbles.com/recap-of-the-comicky-ziney-dinner-night/ on 30 Mar. 2013. What is liedekijn? It means “little song”, the title is from a medieval Dutch folktale, ‘The Song of Lord Halewijn’. Here’s the quote from a translation: “Halewijn zong een liedekijn” = “Lord Halewijn sang a ‘little song’.” Thanks to the wonderful Emma for clarifying the meaning, I have a silly (and incorrect) habit of defaulting to ‘little story’. 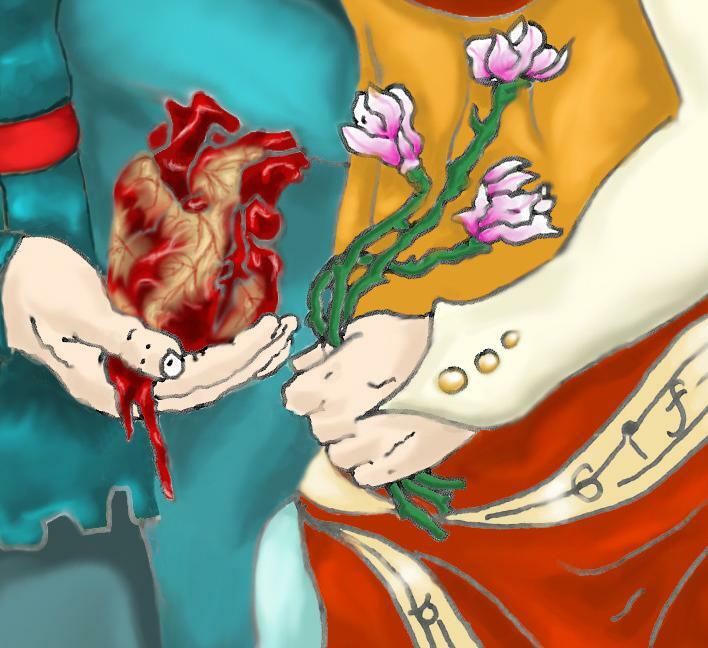 If you like fantasy, gore, corsets and bravery, liedekijn will probably like you too – a group of Australian and international artists have created work in response to the folktale’s translation. So apart from a little song, liedekijn is a beautiful shiny book and real-life art exhibition. Once you have the book you can open it anytime, but the exhibition itself opens 7pm Thursday 28 March (today!) 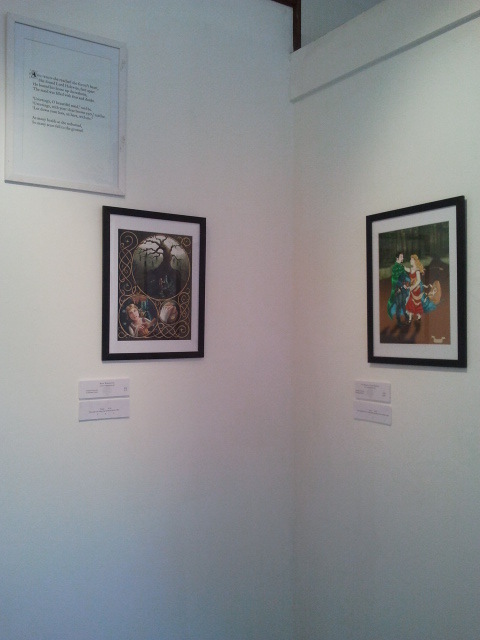 at The Front Gallery, Wattle Street, Lyneham shops, Canberra (near the lane next to Book Lore). We would love to see you at the opening, or during the exhibition (it runs till Monday 8 April). The detail you see on the left is from the drawing that Wesley and I submitted to the exhibition – come along to see it in full! You can buy the accompanying liedekijn art-book at the Front Gallery (opening night only! ), Impact Comics, or other wholesome publication outlets. The book has all the works from the exhibition plus cover art by Melbourne illustrator Douglas Holgate. I am impatiently waiting the library catalogue record for the liedekijn art-book (this should be exciting for non-library people too – if it’s being catalogued in RDA then it will perhaps have all the names of the artists and the translator because the rule of 3 doesn’t matter! But I digress.). Remember to love liedekijn on Facebook and follow the official liedekijn twitter or liedekijn tumblr if that’s more your flavour. Perhaps you’d like to see a picture of Miss Cat sitting on my liedekijn drawing or a 62 year old book on Halewijn (it has etchings! People always accept invitations to see etchings). Then you’ll enjoy clicking the liedekijn tag for other posts. See you at the opening, and remember to take care in the forest! The nights are getting colder, so be careful that you’re not lured into the forest by a captivating song just like Machteld in the Song of Lord Halewijn. A group of artists (including my collaborative work with Wes Hobday) created works about this tale, the results will be exhibited in 27 days! It’s quite gruesome, here’s an easy-to-read version from Ansuharijaz on Reginheim (our version is slightly different). Some of the drawings will be a surprise, but you can see selected works in progress on the liedekijn tumblr. Halewijn’s story has inspired many variations and drawings. 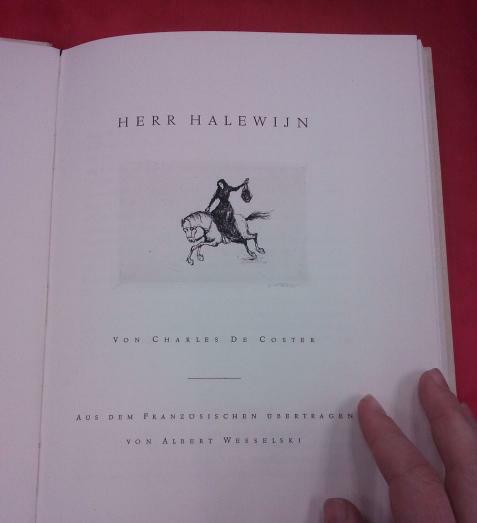 I recently saw Hermann Metzger’s prints in Charles de Coster’s Herr Halewijn (translated by Albert Wesselski). Metzger created 19 etchings (20 if you include the cover) that illustrate the story from Halewijn acquiring the spell, to murdering women and Machteld’s response. The beautiful etchings balance a warm background of plate tone against the pure white of the valiant horse, carrying the boldly outlined Machteld (and her dubious trophy) through the pages. The deckle edges of the paper echo a jagged dirt path through a forest that barely contains the energy of the drawings (all hand signed by Metzger, quite a feat as there were 500 of these limited editions). Halewijn’s body dances with the spell as he struggles to maintain his new-found beauty and ensuing thirst for maidens’ blood. I wish I had paid more attention in German class, as I can only understand the names of the characters Halewijn and Machteld. We’d love to see you at the liedekijn exhibition opening at the Front Gallery and Café, details at the Facebook event. If you can’t make it to the opening or the exhibition, the works have also been made into a wonderful art book which you can buy from the liedekijn big cartel site. I’m excited to be part of the liedekijn group exhibition which will be held at the Front Gallery, Canberra, from 26 March – 8 April 2013. Each artwork will tell a different part of The Song of Heer Halewijn, so you’ll get to move around the gallery and read the story. 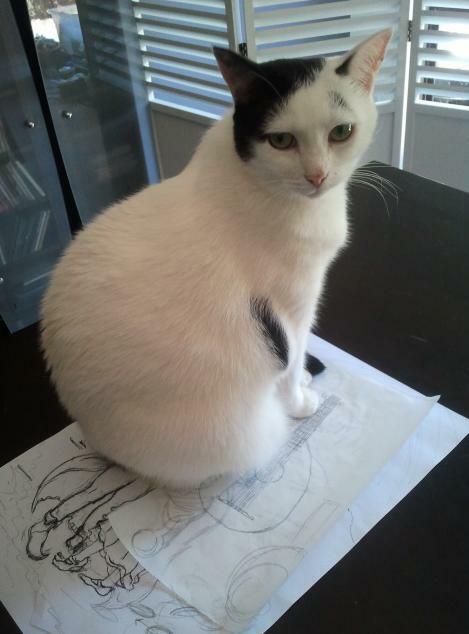 Cat sitting on liedekijn drawing. The part of the story that I’m drawing is when Machteld first sees Halewijn in the forest, she has been lured by the music of Halewijn’s lute. Enchanted by the spell, she embraces him – despite being surrounded by hanging bodies in the trees, his previous hapless victims. As you can see, my Miss Cat is unimpressed by my efforts thus far, below her you can see a large lute which I’m thinking about floating somewhere in the air (as Machteld and Halewijn are embracing, it is tricky to incorporate this instrument). You can also see Halewijn’s muscular legs (surrounded by cape and resplendent with pointy cuffed shoes), it almost looks like Miss Cat has squashed him like in Lady Cottington’s pressed fairy book. The liedekijn artworks from the exhibition are also being made into a full colour artbook – the fairytale has been translated from the olde Dutch so this will accompany the artworks. You can preorder this limited edition book via the liedekijn bigcartel site. Today is the last day for discounted preorders! Some of the works in progress are on the bigcartel site, plus the images are being updated on the artists page of the liedekijn site. There’s additional information about the artbook and exhibition on the general liedekijn site. The story has a dark beauty but it might make you hesitant to venture into the woods!